Bedrooms: 10 "8 Deluxe Rooms and 1 Suite (2 Bedrooms)"
Come see for yourself this beautiful boutique hotel, located just 200 meters (3 min walk) from the beach and surf in Playa Grande. The hotel has 8 spacious hotel rooms, with luxurious finishes, and private bathrooms, as well as an owner's/ manager's apartment with 2 bedrooms, 1 bath, a full kitchen and living room. The hotel also comes with a plush swimming pool and waterfall surrounded by tropical garden landscaping for the guests to enjoy, plus a restaurant and bar that seats up to 100 people. The hotel was recently remodeled and is in immaculate condition. Each hotel room has beds for up to 3 people, and are equipped with Air conditioning, cable TV, stylish furniture, decorations, closets, mini refrigerator, and private baths. Linens and towels provided to the guests are of the highest quality. There is approximately 6,000 square feet of construction and the lot size measures around 1,700 square meters, which allows room for expansion. Playa Grande is a fantastic tourist destination beach, popular for surfing, beach and nature lover's of all kinds. Playa Grande is well known as a world-class surfing beach as well as a refuge to the leather back turtles, known as an oasis on the coast and an alternative to the nearby bustling town of Tamarindo. There are several other restaurants in the small town of Playa Grande, and the more populated town of Tamarindo is just 20 minutes away by car. Playa Grande is also close by many other gorgeous and secluded beaches. The international airport in Liberia is just 1 hour away, and there is a paved road all the way to the front door of the hotel. 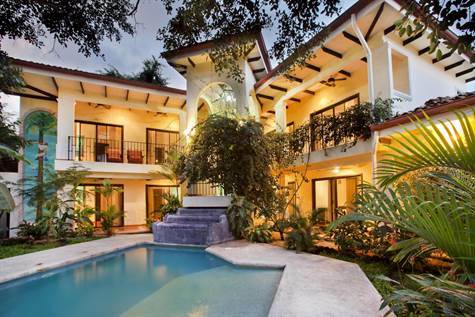 Located less than 2 blocks from the beach and the main surf break in Playa Grande. The hotel has a capacity of up to 28 guests between the 8 hotel rooms and the apartment. There is also a fantastic on-site restaurant/bar which offers indoor and outdoor seating. The restaurant has a seating capacity of up to 100 people and is sold with all permits and an operating liquor license. Financial history is available upon request. Serious inquiries only please.